Sweet wines have a unique following. Some scout for a sweet wine as their candied-introduction to the world of wine, as a toothsome path from sweet, flavored sodas to the drier lines of regionally-inspired red and white wine. 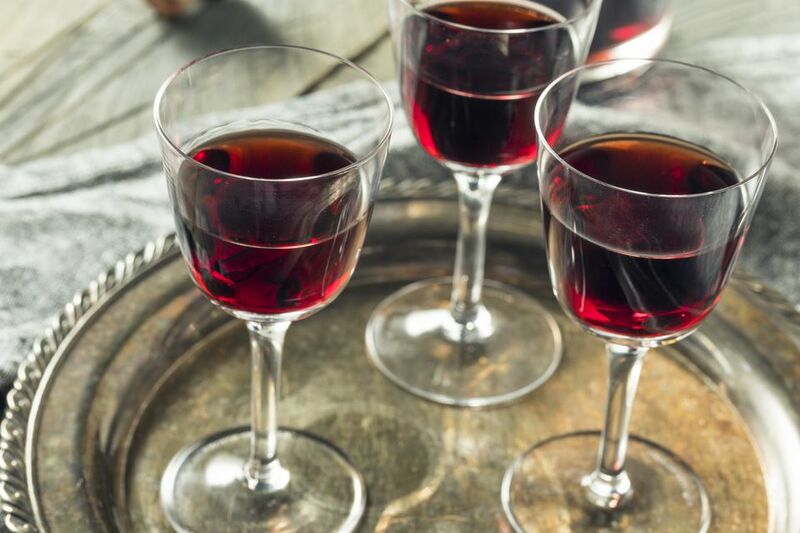 Others prefer the full-bodied flavors (and often sweeter styles) of fortified wine, be it Port or PX Sherry, as an after-dinner treat complete with strong cheese or a variety of desserts. A wine is rendered sweet due to its residual sugar (RS) content. When grapes are brought in from harvest they are crushed and then put through fermentation. During fermentation, the sugar is converted to alcohol by yeast. If fermentation is halted prior to complete conversion from sugar to alcohol, some of the sugar will reside in the wine, hence the term "residual sugar." Obviously, the more residual sugar in a wine, the sweeter the wine will be. While sweet red wines are certainly less common than sweet white wines, they are available. Port wine: Port is perhaps the most famous sweet wine made from red wine grapes. Next, there are dessert wines made from red grapes with higher levels of residual sugar and a sweet, unctuous profile. Ice wine: Some ice wines are also crafted from red wine grapes (often Cab Franc), though these can be a bit harder to find. Scout for Inniskillin ice wines based on Cab Franc for a deliciously, sweet red wine treat. Regional reds with a touch of sweet: Germany's Dornfelder and Italy's Lambrusco are lighter-bodied reds that may across somewhat sweet on the palate. As is the effervescent appeal of Italy's Brachetto—a red dessert-styled wine carrying less alcohol and more sweet upfront. Try Fizz 56 Sparkling Wine for a popular Brachetto. Sweet Shiraz: Looking for a well-distributed, wallet-friendly sweet red wine? Check out South Africa's Jam Jar Sweet Shiraz is a top pick in the sweet red wine category. Sweet white wines are far more common and considerably easier to find than sweeter-styled red wines. Riesling: The first stop on most treks towards sweet white wines begins in Germany with Riesling. Based on the Riesling grape, these particular wines may be made in dry, off-dry and downright sweet styles, the sweeter style is what consumers tend to be most familiar with. Moscato: Originally from Piedmont, and built on the Muscat grape family, this white wine continues to gain momentum as the "go-to" white for sweet wine enthusiasts. Light-bodied, sometimes showing a spritzy sparkle and always carrying sugar, Moscato fans relish the awesome aromatics and palate pleasures of this well-loved wine. Sauternes: Next stops on the trail of sweet white wine often include ice wine and late harvest styles, such as Sauternes. Bordeaux's prestigious dessert wines are made from the Sauvignon Blanc and Semillon grapes that have been affected by botrytis, a friendly fungus, to concentrate the grape's innate sugars. Ice wines are a truly unique, dessert wine, made from grapes that have been frozen on the vine and then fermented. Originating in Germany and reaching star status in Canada, ice wine is one of the sweetest wines around because the grapes' sugars are extremely well concentrated as the grape freezes. For those seeking a delicious dessert wine find that will pair well with a wide variety of your favorite fruit, cream or chocolate-based desserts (or act as dessert itself), check out our top wine finds that lie distinctly on the sweeter side of the vine, classic dessert and ice wines. Fortified wines are an unusual class of wine, that offer richness, age, and class to many desserts and rich food favorites. While not all fortified wines are made in a sweet style, many of them are. However, the most famous fortified, sweet wine hands down is Port. If a sweeter fortified wine is desired, then neutral grape spirits are typically added within the first day and a half of fermentation. Once this additional alcohol is added to the still base wine, the yeast stop converting sugar to alcohol and all of the remaining grape sugar is left in the wine as residual sugar.